NEW FEATURE! INTRODUCING ............................ THE "AQUA" -- THE ALL QUACKED UP AWARD!! Yes, it's true - Hollywood, Cannes, and Sundance are abuzz with the news. Move over Academy Awards, NFL MVP trophies, Golden Globes, and Baseball All-Star distinctions ... the newest spotlight in the sky is for the rare, the exciting, All Quacked Up Awards! Referred to by the cool people in the know as the AQUAs, they will be given out ONLY to the elite few ... the top 1% in their category: products meant to go in or on a human's body, but that really, really, really shouldn't (in my humble opinion)! They are the food, toiletries, medicines, or other products that prove that quackery is far from dead in the 21st century. These are the items that give us collectors and quack historians hope because there are still things to laugh at, be upset over, sickened with or just completely grossed out by. We are busy designing the perfect award to represent the AQUA, and we will reveal it to you soon! In the mean time, our first award winner is SO deserving that we just had to honor it with our very first All Quacked Up Award. Drum roll, please ....................... Ladies & Gentlemen, I present to you the first winner of the All Quacked Up Award, the KFC Double Down Chicken Sandwich!!! (TA-DAH!). Please watch our video clip under the all new list of AQUA winners in the right column and be awed by their supreme achievement in totally earning the first AQUA! And so now we come into the modern era, the age of real knowledge and enlightenment because, hey, isn't that what we believe about the time in which we personally live? All those people who lived before we were born believed and slogged through superstitions, antiquated notions, and the dark forest of ignorance, but we are at the top of the evolutionary ladder; we are what they were all trying to be. We've got electricity, they had fire; we've got cell phones, they had to write letters; we have computers, they had pencils and paper. We have medicines and doctors performing at such an advanced level that we patients can't even comprehend it, but they're the best ever because they just are. These are modern times and clearly the best of times. Errr ... sure, in the days before we were born our ancestors thought the same thing of their doctors and medicines, but they were wrong and we are right because we've got the whole package today. We're at the apex; the pinnacle; top of the heap. How ignorant they; how brilliant we. Yeah, baby. Seriously, I am so grateful for living at this time of history. Even though I know that there is still a lot about illness, medicine, and the human body to be learned, I have more faith in my doctor and pharmacist than I could ever imagine having in their counterparts 50, 100, or 150 years ago. My study of the pursuit of health in the 19th century has given me the gift of gratitude for what I enjoy today, no question about it. We still have to do our part, avoiding the traps of quackery and taking responsibility for our own health, but as I look at newspapers, magazines, television, the internet and the mirror, I realize that we are still a pretty gullible, silly bunch of beings. Case in point: the announcement this week by Kentucky Fried Chicken for their new breadless sandwich: cheese and bacon "sandwiched" between two pieces of fried chicken - are you kidding?!?!?!?! And you and I know people are going to buy them. Quack: A person who pretends to have medical knowledge and skill which he does not possess. In general, when people speak of quacks they are referring not to the many medical laymen who enjoy giving medical advice (usually unsound) to their friends but rather to persons who may have some medical education, or even experience in medical practice, but who are misguided, incompetent, or dishonest. A few quacks actually have the M.D. (Doctor of Medicine) degree and are licensed to practice. Other quacks lack the standard medical education and are not licensed. ... Many quacks specialize in making and selling useless or harmful patent medicines. Interestingly, that definition suggests that those who do not get paid for their medical advice are not quacks. That makes me feel a little better. You see, it has always amazed me how often I am asked for my "medical" opinion about someone's condition, apparently because I have a pretty good knowledge of the human body and its functions. But what I know I learned from studying the history of quack medicine! Good grief! Countless times they have followed my observations and advice because it sounds, I guess, like I know what I'm talking about! Even when I point out to them that I have no formal medical training, they still seem so interested and respectful of my medical opinions and advice. I think the reason for that is mainly because of the combination of good-sounding information with the fact that it's free. How ridiculous is that? What they should do is find out what I do when I'm sick and miserable. I go to somebody who really seems to know what they're talking about ... my wife. Now there's an expert. Oh yeah, and she doesn't charge me, either. Quack: One who practices quackery. ... the multitudes who, worn with bodily malady and spiritual dejection, ignorant of the source of their sufferings, but thirsting for relief from them, have gone from charlatan to charlatan, giving hoarded money in exchange for charms, cramp-rings, warming-stones, elixirs, and trochees, warranted to cure every ill that flesh is heir to. The scene, from another point of view, is more droll, but scarcely less mournful. Look away from the throng of miserable objects, for a few seconds, who press around the empiric's stage; wipe out for a brief while the memory of their woes, and regard the style and arts of the practitioner who, with a trunk full of nostrums, bids disease to vanish, and death to retire from the scenes of his triumph. There he stands - a lean fantastic man, voluble of tongue, empty-headed, full of loud words and menaces, prating about kings and princes who have taken him by the hand and kissed him in gratitude for his benefits showered upon them - dauntless, greedy, and so steeped in falsehood that his crazy-tained brain half believes the lies that flow from his glib tongue. Are there no such men amongst us now - not standing on carts at the street-corners, and selling their wares to a dingy rabble, but having their seats of exchange in honored places, and vending their prescriptions to crowds of wealthy clients? Quack: A term applied, by way of derision, to a person who professes to cure all diseases by a single remedy (or in accordance with a single dogma); also to remedies which are sold under the protection of a patent. All experience shows that mankind are ever more ready to believe pleasant falsehoods than disagreeable truths. Quackery takes advantage of this proclivity, and therefore caters for the universal appetite. A perfect quack is a most obsequious sycophant - his medicines are always exactly what the patient wants. They are never disagreeable, are perfectly safe in all cases, and always certain to cure. These are what every sick man wants, and therefore strives with all his might to believe ... whenever any positive benefit has resulted ... it has been accomplished through ... the mind (rather than through the body). ... All (quacks) pretend to (have) new and very important discoveries - all are bitterly hostile to the regular profession - all boast of their wonderful success and rapid increase, and all are only so many different views in the same great panorama passing rapidly along, never to return. Obsequious sycophant? Good grief; no wonder people called them quacks instead. Everything differing from the old school is termed quackery? What is quackery, then, but improvement? First of all, there's really no such thing as a quack doctor. There are people who pretend to be doctors, but dignifying them with the word "doctor," even after the word "quack," is still disparaging the good name of real doctors. Calling them "quacks" is a very good descriptor, though. The quack of a duck is loud and annoying and completely incomprehensible to anyone, except perhaps those who are a few sandwiches short of a picnic. But the problem has always been that these medical pretenders don't quack loudly enough. Their victims - the good, honest, ignorant, and desperate - are too often all too ready to take off their clothes, open their wallets, and swallow mystery liquids, powders, and pills for a person who is better qualified to make license plates than to be doctors. Why is that? Because those little quackers are so good at their real craft - deception. Quacks are either deceiving their victims or themselves. The appearance of mystery in the conduct of physicians not only renders their art suspicious, but lays the foundations of Quackery, which is the disgrace of Medicine. No two characters can be more different than that of the honest physician and the quack; yet they have generally been very much confounded. The line between them is not sufficiently apparent; at least is too fine for the general eye. Few persons are able to distinguish sufficiently between the conduct of that man who administers a secret Medicine, and him who writes a prescription in mystical characters and an unknown tongue. Thus the conduct of the honest physician, which needs no disguise, gives a sanction to that of the villain, whose sole consequence depends upon secrecy. No laws will ever be able to prevent quackery, while people believe that the quack is as honest a man, and as well qualified, as the physician. ... it is the ignorance and credulity of the multitude, with regard to Medicine, which renders them such an easy prey ... .
Don't just count the diplomas and certificates on your doctor's wall. Don't just assume that his fancy office, or your big bill, is evidence that he's a qualified doctor. The AMA encourages you to do so. No real doctor will protest your desire to protect yourself and your family. Check them out before they check you out. "Quack is Quack, and Cure is Cure, and never the Twain shall meet"
Everyone knows quackery when they see it, right? So why is there so much confusion about it, even today? Well, I think a quack or quack medicine is a lot like art in a gallery. You can stare at something and blurt out, "Isn't that hideous?" and your friend immediately agrees, but then you both realize you're looking in opposite directions at different pieces in the room. Quackery, like beauty, is in the eye of the beholder. You may think that TV evangelist healer is a quack - a pretentious fraud - but your spouse is moved to tears by the miracle they just witnessed. Every time I take Waldryl (the Walgreen knock-off of Benadryl) my runny nose seems to dry up right away, but my son is equally convinced that those little pink pills are a rip-off because they never seem to do anything for him. In the days ahead, I will be sharing how others have defined quackery, so get prepared for a bumpy ride. For today, I am going to share with you what Mark Twain thought of one healer whom he decided was a quack. I read about this three years ago, not in a great history book or on some detailed television documentary, but on eBay. Somebody was offering for sale an authentic letter from Mark Twain, America's greatest humorist. The starting bid was $9,900 and, call me wimpy, but recognizing that was more than my net worth, I didn't even bid. But I drooled a lot. And now I can tell you I am the proud owner of the actual photocopy of the virtual image of the authentic letter of Mark Twain. Close enough. In 1905 a West Coast medicine seller named J. H. Todd wrote to Twain, offering to sell him T. Duffy's Solution, The Elixir of Life - a Blood Purifier, Antisceptic, Disease Destroyer, and "Giver of Life Everlasting." 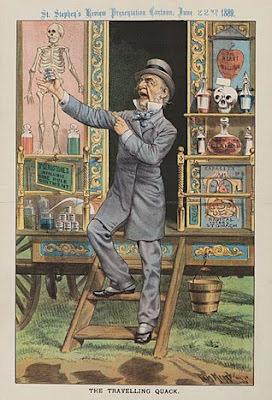 A four-page brochure for the medicine explained that the elixir was "A THOUSAND TIMES MORE PURER than the Water and MATTER," and that this marvelous fluid absorbed "all Unsanitary, Foul and Diseased Matters, as foul water, foul air, diseased and putrid flesh or blood, and foul gases of Malarious Nature," purifying them "by its PURITY of PURIFIEDNESS ... ." The elixir cured dandruff, appendicitis, blood poison, 8 diseases starting with the letter "C," diabetes, diarrhea, female diseases, hemorrhaging, poison oak, tape worm, cat, dog, and horse mange, and as you would guess, a whole lot more. I assure you, there were people that bought The Elixir of Life - but Mark Twain was not one of them. The person who wrote the [brochure] is without doubt the most ignorant person now alive on the planet; also without doubt he is an idiot, an idiot of the 33rd degree, & scion of an ancestral procession of idiots stretching back to the Missing Link. ... A few moments from now my resentment will have faded and passed & I shall probably even be praying for you; but while there is yet time I hasten to wish that you may take a dose of your own poison by mistake, & enter swiftly into the damnation which you & all the other patent medicine assassins have so remorselessly earned & do so richly deserve. Ummm, I think Mr. Twain was calling Mr. Todd a quack. Let's see what you think in the days ahead. They may not have done much to cure people, but they sure were pretty to buy! If you haven't been in New England in the fall, GO! 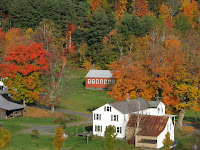 Autumn in New England is timeless: winding country roads, quaint village greens, covered bridges, geese flying south in precise formation, an exhilarating crispness in the air, pumpkin patches, and of course, stunningly beautiful trees with their leaves fluttering in the breeze. I love the beautiful colors of the New England fall - especially the cobalt blue. You see, the only thing better than New England's colorful trees in the fall is enjoying its colorful trees and beautiful bottles. Both are truly timeless. 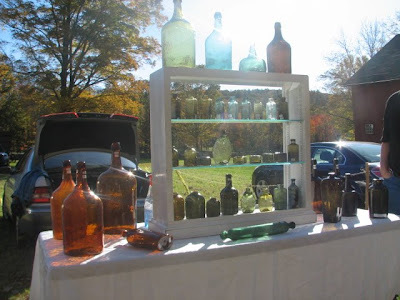 Without question, my favorite "New England experience" is the tailgating bottle show on Norman Heckler's property in Woodstock, Connecticut, on Columbus Day Weekend. I have timed my vacation trips back home to coincide with that special day. There, on that awe-inspiring Colonial property, with the backdrop of trees dressed in their autumn plumage, folks set up tables and cover them with an array of their finest autumn colors: honey amber; grass green; ruby red; cinnamon, teal, aqua, and peuce. 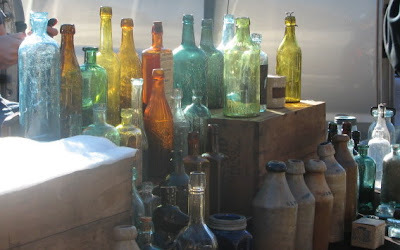 Some of those bottles are lucky enough to still have labels, aged and foxed in antique browns. 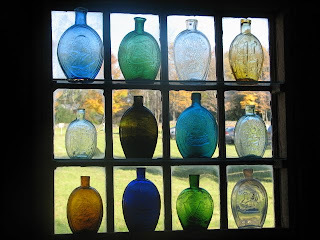 An outdoor bottle show in New England in the autumn: you've got to see it to believe it. And the really nice thing is, it's a lot easier to bring a New England autumn bottle home in your luggage than it is to bring a New England autumn tree. What WAS Momma feedin' this kid?? 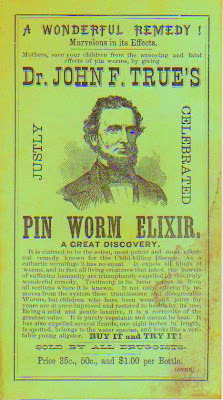 In honor of my friend, Donna, from Maine, I am focusing today's entry on one of the best and rarest trade cards in my collection: Dr. John F. True's Pin Worm Elixir, made originally in Auburn, Maine. Boy, is this a story waiting to be told! In the 19th century, people worried a good deal about getting worms. Some of the concern was warranted and some of their fear was drilled into them by ads and notices of itinerants who claimed their medicines had successfully extracted worms of gigantic proportions. I just read one such itinerant's claim in a Lynn, Massachusetts newspaper from 1875 of a patient who had been relieved of a worm 147 feet long! More likely, the only big thing that had been "passing through" was the itinerant himself once he had a sufficient dose of his patients' money. Adults and children were equally susceptible to getting worms by eating food containing tapeworm segments and eggs or pinworm eggs. Yum. Being a mild and gentle laxative, it is a corrective of the greatest value. ... It has also expelled several lizards, one eight inches in length, is spotted, belongs to the water species, and looks like a veritable young aligator. There were lots of medicines back then promising to remove worms, but as far as I know, only True's promised to remove lizards and alligators. No wonder there are so many of those bottles being found now. By the way, the world is still full of tapeworms and pinworms today. Well look at that - it's almost lunchtime! It's 5:32 pm here (no matter what my computer clock says) and things are winding down. It's that time of day when many guys will be lifting a bottle - a cold one - to drink; but me, I'd rather be lifting a bottle - an old one - just to admire and research. Kind of funny that a guy so interested in bottles doesn't drink alcohol; probably 99% of the bottles in my collection contained alcohol, either as a refreshment or a medicine; in fact, some of them still have contents. The alcohol in medicines were used as a bracer and a sedative, but also as antifreeze and a preservative. Until the late nineteenth century, most homes did not have heat beyond that produced by the fireplace or the stove. This left much of the house very cold on a cold winter day or night. I have read several journal entries of ink frozen in the bottle and medicine bottles that had exploded due to frozen contents. I once lived in a house in central Massachusetts built in 1794 that still had no heat on the second floor, where our bedrooms were. In the morning on the coldest days we would awaken to the sight of ice covering the bedroom window panes - on the inside! We kept anything liquid on the first floor. That last reason for alcohol in medicine - as a preservative - is also hard to understand today. Many of the medicines had lots of plant matter in them and the alcohol was used to preserve them - in effect, to "pickle" the contents. But after 140 years or so, the plant matter, water and alcohol move around in the bottles like murky greenish-gray clouds oozing over swamp muck that had sucked down wooly mammoths. One look at the bottles in my collection with full or partial contents is enough to keep me a non-drinker for the rest of my life - and to always make sure they don't freeze - I never want those bad boys exploding their swamp-muck contents into my study! As much as I love digging in the dirt, I've only gotten to do so a few times in my life. I remember when I was a little kid in Dartmouth, Massachusetts, playing with my best friend and our toy trucks on a huge pile of dirt that had been excavated to create a cellar hole. As I pushed my Tonka truck through the dirt, it uncovered a piece of a very old dish, then another, and another. Then a clay pipe bowl. Then more stuff. Something primal just took over and I parked my Tonka and started digging for the stuff. My little friend thought I was nuts and kept playing with his truck. He was right - I was crazy and still am: I love to dig for evidence of people who stood on the same ground long ago. When another friend showed me the site of a small dump on a hillside in Saugus, Massachusetts, you would think I was at Sutter's Mill in 1849! I dug like a crazed archaeologist! I found a few clay marbles, a few Chas. Crompton & Sons bottles, an odd-shaped goldish thing with a decoration on it, an engraved silver bottle top, and an Indian Head penny! I was in hog heaven. Then there was the dig with my sons in Maine. They were about 8 and 7 years old and this was their first time digging with Dad. You can see the "treasures" in their hands were just a bunch of junky bottles, a flower pot, and an old hubcap to put them in; you can tell from the smiles on their faces, they felt like they had just dug up the Hope Diamond. 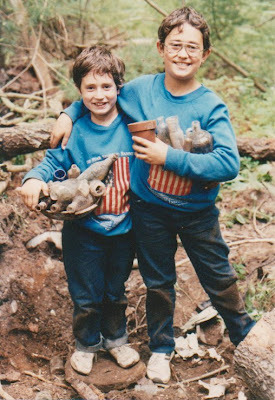 That day, my friends, is when I found one of my greatest treasures - the memory of diggin' in the dirt with my boys. There are millions of Lydia E. Pinkham Vegetable Compound bottles out there because the medicine was just so darned popular. And because it was purchased by millions of women, bottle diggers and bottle collectors could care less about them. The bottle itself is pretty ho-hum to begin with. Not a fancy shape or color and the most basic embossing. Not pontiled either. Now if you come across a labeled version on the internet or in an antique shop or yard sale, odds are verrrrrrrrrry high that the color of the label will be somewhere between aged tan to rotted pumpkin (keep your jack-o-lantern until December to see what I mean). That was the color range for about 70 years. The label's text and design changed from fancy Victorian promises to government-issue boring, but what almost nobody knows is that the very first Lydia Pinkham bottle had a blue label. Yes, boys and girls, it is the ultra-rare, fabulously valuable, and hauntingly beautiful Blue Lydia. I know of only three in existence after almost 30 years of collecting and researching. The best and earliest example is at the Lynn Museum and Historical Society in Lynn, Massachusetts. The second best example is in a private collection a few miles from my home; and the third is also in a private collection but has all of the blue leached out so that the label is just aged tan. I do not have one; I am not yet worthy. But I have been allowed to hold and photograph all three and now I put an image of the best one into your virtual collection. You're welcome. I have been collecting, researching, and writing about medical quackery for well over two decades. I think it is fascinating, wild, and crazy and I can't get enough of it. But here's my problem: I know almost nobody who has the same interest! I have gone to bottle shows but I don't know anybody at those and have not been able to get anyone to continue communicating with me about this stuff by mail, internet, or otherwise. I tried to volunteer (should be easy, right?) to be involved with one of the bottle collecting groups, but after a short flurry of using my help, they stopped contacting me - talk about giving me a complex. I have learned that the collectors in this area are often quirky people - yeah, me too. My wife and children endure all my stories because, well, they're my wife and children. But I run across way too much really cool stuff to believe there's nobody else out there interested, so now I'm going to try this blogging thing. I'm going to try to share all kinds of anecdotes and tidbits that I've accumulated as well as those I uncover as I continue my research and collecting. If you're out there and find yourself interested at all in my blog (or even a teeny tiny part of it! ), please let me know. So starting with my next entry, I will share my first story ... about the Blue Lydia.